It's officially the holiday season! Now that Black Friday and Cyber Monday have come and gone, don't worry! 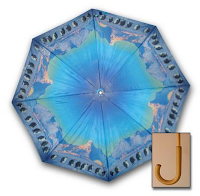 Umbrellas.com has tons of gift ideas for every member of your family. From the youngest to the oldest, this holiday season we have you covered...literally. 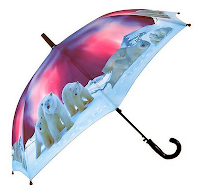 One of our newest additions is the Polar Bear umbrella! It comes in both stick and folding form and is absolutely stunning. It features a polar bear family (including the most adorable cubs!) and an aurora sky above. It would be perfect for any adult, teen, or anyone who loves these wild animals. Fun fact - A polar bears fur isn't actually white! The hairs are actually hollow and reflect light making them look white. Who knew?! Our holiday dome umbrella is another pleaser among our customers. 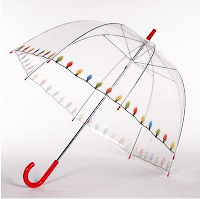 Take a clear "bubble" umbrella, add a little holiday flare, and voila - you have the perfect umbrella for the holidays! Colorful lights run around the rim of the umbrella making it that more special and unique. From children to 90 year olds, this umbrella would make a great addition to their rain gear. Another animal that gets popular around this time of year is the penguin! If you're a fan of these tuxedo birds, then our emperor penguin umbrella is a perfect fit for you! A family of penguins walk in a line with snowy mountains behind them and a beautiful sky above them. 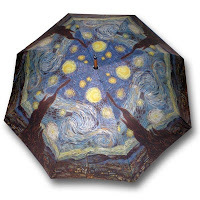 This umbrella would be an amazing gift for anyone! From everyone here at Umbrellas.com, we hope you have an extraordinary holiday! Grab your coats and unpack all of your sweaters because Fall has officially arrived! Besides the leaves changing colors and the temperature dropping, what do most people associate October with?...Halloween of course! This year, Halloween will fall on Wednesday the 31st. Do you plan on going out this year to trick-or-treat? Or will you be inside watching scary movies and giving candy out? No matter where you are, have fun and dress up. Be something that you're not for one night and don't hold back! Children have some of the best costumes around. They can range from adorably cute to frightfully scary. Do you have any children that will be dressing up this Halloween? Make sure to bundle up if the weather is cold, and if it's raining, don't let it stop you from going out and having a great time! 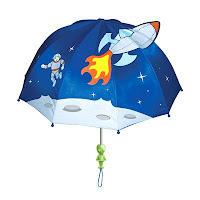 At umbrellas.com we have tons of kids umbrellas that will go with countless kid costumes. Did your little boy or girl decide that they wanted to be a frog this year? 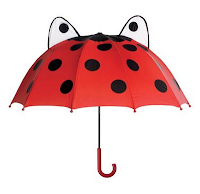 Well we have the perfect umbrella to go along with their costume! 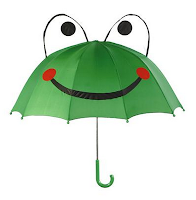 Our 3D Frog umbrella is a best seller and favorite among kids. To make a simple and easy costume, simply dress your child up in all green and let the umbrella do all the work! Pirate costumes are always big among children. Who wouldn't want to be a pirate?! You get to wear an eye patch, an awesome hat and you get to carry a parrot around with you all day! 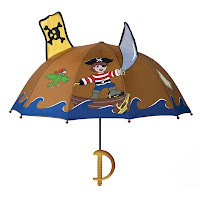 If a pirate costume is what your kids want, get this cool pirate umbrella to compliment their outfit. The handle is even shaped like a sword hilt! Ladybugs are also a favorite among kids. Babies look especially cute dressed as the little lucky bug. It's usually said that the more spots a ladybug has, the luckier it is! 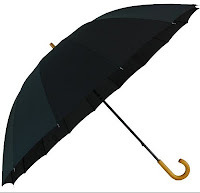 This umbrellas (as well as the rest of our child size umbrellas) will fit perfectly in your child's hand. They are specifically built for little bodies! You can't have Halloween without the sighting of a cat. Cats and Halloween go together like peanut butter and jelly. Instead of being a black cat though, how about a cute pink cat? 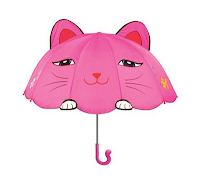 Our 3D Cat umbrella would look adorable walking down the street with you child. The handle looks just like a tail! No matter what your child decides to be, make it a night that they won't soon forget. Have a Safe and Spooktacular Halloween! !